Authority member Don Phillips also told the group he will be prepared by its next meeting in August to present costs for constructing a building or buildings from 10,000 to 50,000 square feet in size at the business park should the Authority wish to go in that direction. Earlier in the meeting, J.R. Charles, Economic Development director for the county, told the group that businesses looking to locate in the county often turn away when they learn that no space already is available for them. The Authority has had only limited success developing the Gateway business park, which it has owned since 2000. The roughly 100 acres that make up the park are split into four noncontiguous parcels, two small ones south of SR 316 and two large ones north of the highway. The two larger tracts are separated by acreage that the Authority does not own but will have to be crossed by the proposed sewer line. Earlier this year Alexion terminated a contract for purchase of additional acreage. The large, western parcel of the park does not have sewer service, and Authority member Wayne Bagley said at the June 12 meeting that he and member Ed Perkins had looked into some options for possibly extending service from the tract where Alexion is located westward. Bagley proposed that the Authority authorize Chair Rick Waller to spend up to the $35,000 to hire a civil engineering firm to perform the field work and possibly design the sewer extension. Waller said he would turn to Precision Planning of Monroe for the field work and design. The Authority will have to modify the budget it approved at its meeting in May to cover the costs of the Precision Planning contract if it reaches the $35,000 figure. The Authority receives $9,460 each month in rent for the Post Office building in Watkinsville and is line to receive as much as $850,000 from the 2015 Special Purpose Local Option Sales Tax approved by voters in 2014. Waller has spoken of using some of that SPLOST money to provide sewer service to Gateway. The Financial Report that County Finance Director Wes Geddings gave to the IDA at its meeting last week showed $805,956 in its banking accounts, not including the SPLOST money or money from the bonds sold by the Authority to finance construction of Parkway Boulevard Extension. 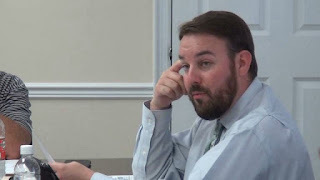 The meeting on June 12 took place at the conference room in the Oconee County Chamber of Commerce on Nancy Drive in Watkinsville. The video below is of the entire meeting, and Bagley’s comments start at 24:20 in the video. The Authority decided not to hold its regular July meeting but to make a field trip to Colbert in Madison County instead to look at two biomass power plants being built there. OCO: Industrial Development Authority 6 12 17 from Lee Becker on Vimeo. Wanna bet the costs of planning and engineering a proposed sewer line will conveniently reach at least $35,000? With already planning to somehow meet costs over that amount, there is a really good chance it will be higher. Who is this Precision Planning of Monroe, and how did that company get chosen for the job? Where there any other bids for the work? Now there may be an interesting venture into actual construction of some kind of building for some kind of business which maybe possibly perhaps be interested in buying space already built for whoever/whatever business looking for some kind of space. Gee, who gets that project? Wow. The bills for the top 10% of North Oconee might be quite stratospheric. Meanwhile, the other 90% of Oconee County gets to observe their money go north. The Oconee County Industrial Development Authority has an incredible amount of power; only county commissioners have more say in the future of the county. Yet the obvious question is: What have they actually accomplished??? Have owned the Gateway Business Park since 2000, and there's only been one sale of land? How is that possible? It's hard to be that underperforming, even with the financial crisis of 2008-ish. "Beshara told the Authority that the road is not designed to meet transportation needs but rather to open up for development about 200 acres in the retail corridor of the county. The road as designed does not include sidewalks and has limited cuts for access along its route." Oconee is next to UGA, and yet there's been no effort to bring bio-tech, tech, engineering, health sciences businesses related to UGA here to Oconee. The IDA meetings are not online unless Lee Becker records them. They operate with little sunlight. Simply put, where are the results? Oconee deserves much better.